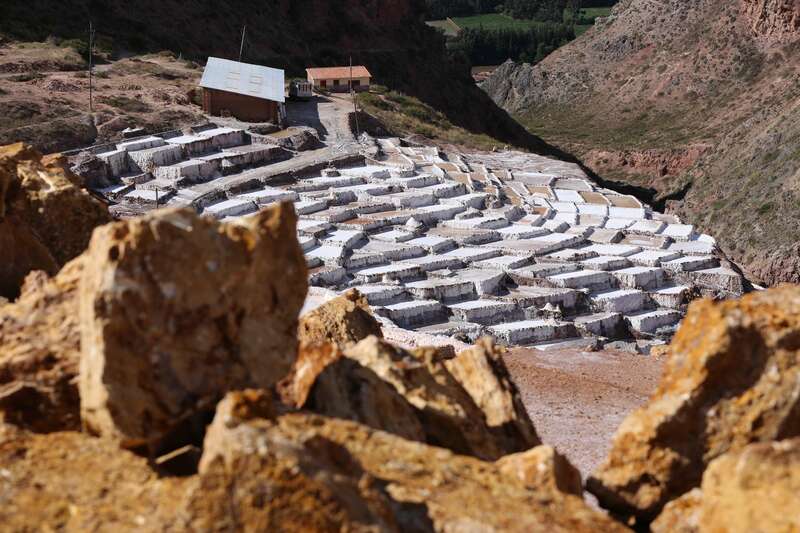 High up in the Andes Moutains, in the upper reaches of Peru’s Sacred Valley, the salt works of Maras have produced salt for centuries. 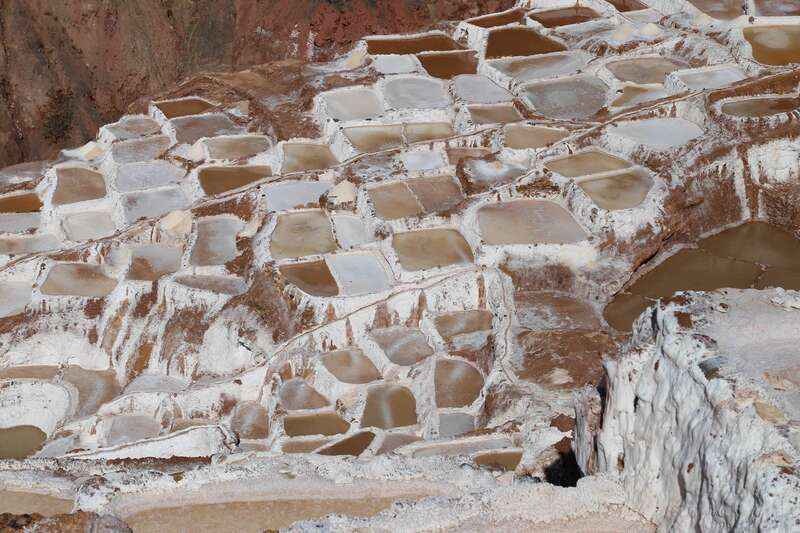 Over time more and more ponds have been added to the salt works at Maras, Peru. Today there are approximately 3,000. Our value as human beings has been compared to salt. Someone highly regarded is said to be “worth their weight in salt” and someone of integrity is considered a “salt of the earth.” The all-important word, “salary” comes from the word salt. The Andes Mountains of Peru may seem like a barren place but they are full of surprises — and resources. In this case, precious salt. In the highlands of Peru, about 25 miles northwest of Cusco, the village of Maras is nestled high in the Sacred Valley. 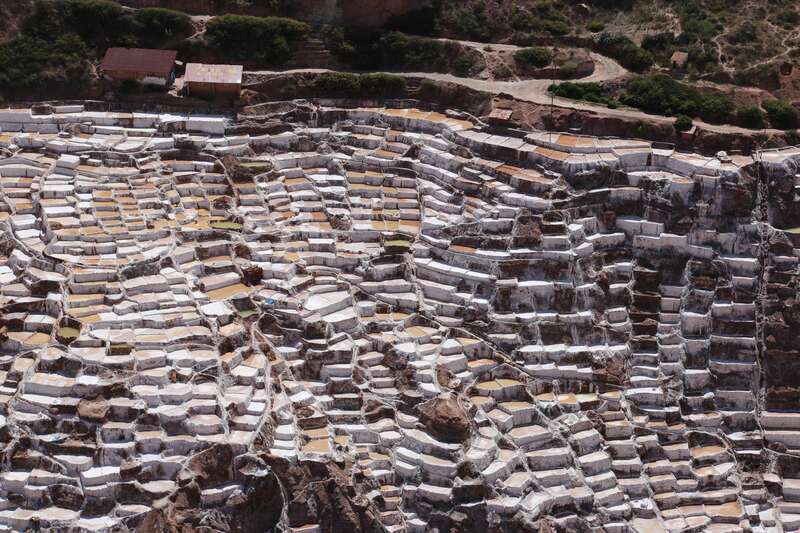 Salt has been produced here in small family-owned plots since times before the Incas ruled the land. You might wonder where the snow came from. But as you get closer, you appreciate the importance of the Maras salt works. From a distance, the patchwork of plots at Maras looks like snow has dusted land that sits around 10,000 feet above sea level. The salt begins as a brine spring from the hillside nearby, flowing from a salt dome deposited in the region some 110 million years ago. 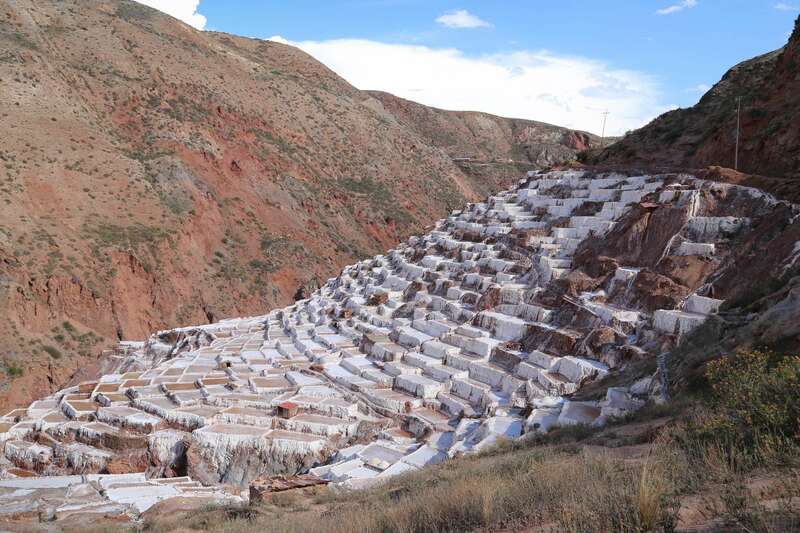 The Maras salt makers work their plots from May to November, the dry season, using a relatively simple process that has not changed since they began. 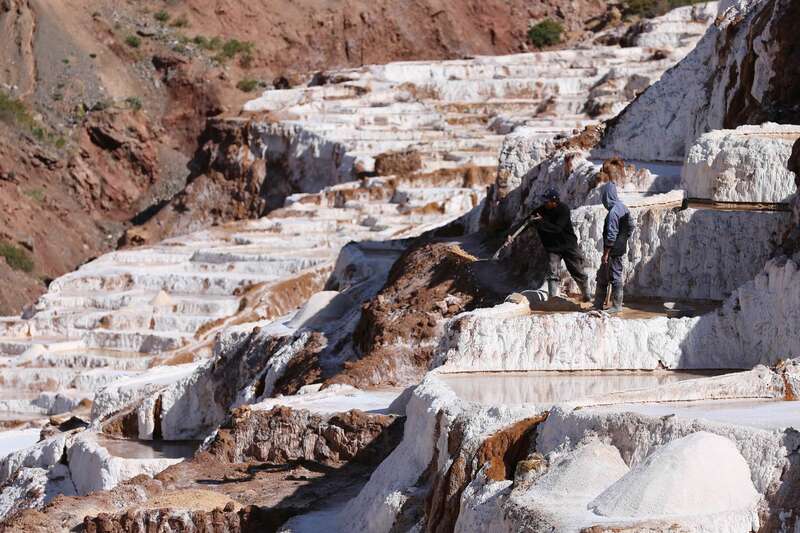 But make no mistake: producing salt at Maras is hard work. 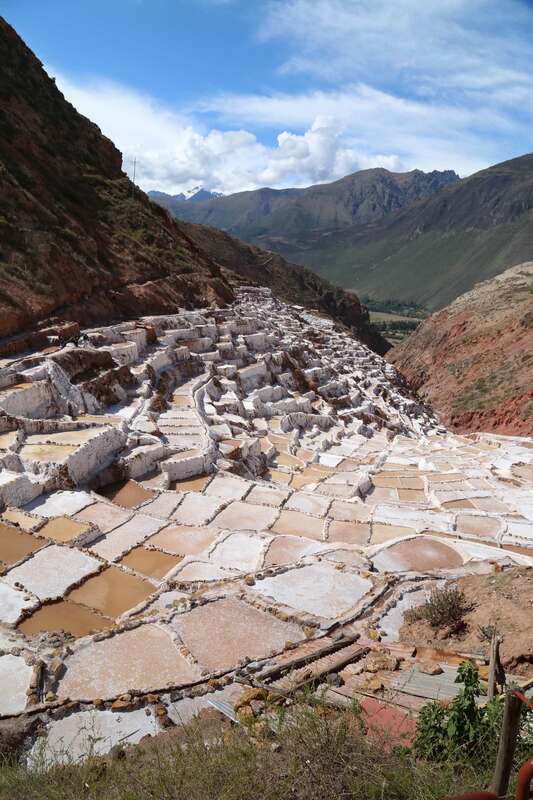 What appears as a hodge-podge of chaos are ponds to produce salt at Maras, Peru. Note the small channels that carry brine to each pond. About 3,000 helter-skelter plots tumble down the hillside. The brine spring is channeled and water fills a particular plot. 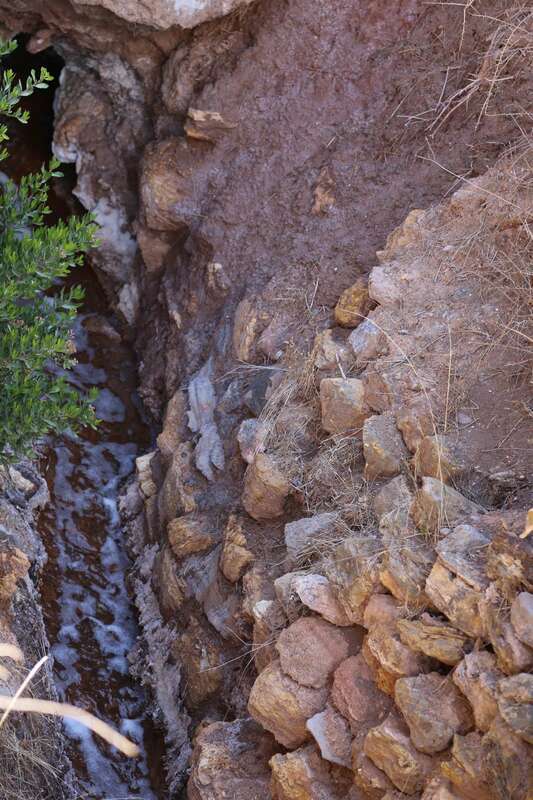 Once full, water to that plot is diverted away by a system of weirs; the sun evaporates the water and salt crystals are left. The salt is carefully scraped into piles, loaded into bags and carried off for sale. The pond is refilled and the process begins again. Depending on the initial depth of a brine pool, a salt maker can harvest in three to four weeks, depending on weather, sunshine and ambition. As the water evaporates, salt crystals remain. After weeks, the brine has evaporated and the remaining salt is ready to harvest. Here a crew empties a pond to prepare it for refilling. Note the piles of gathered salt at the bottom right. The single spring that produces the brine has been flowing continuously for over a thousand years. The salinity and flow rate have not dropped and there is every expectation both will continue for many centuries to come. 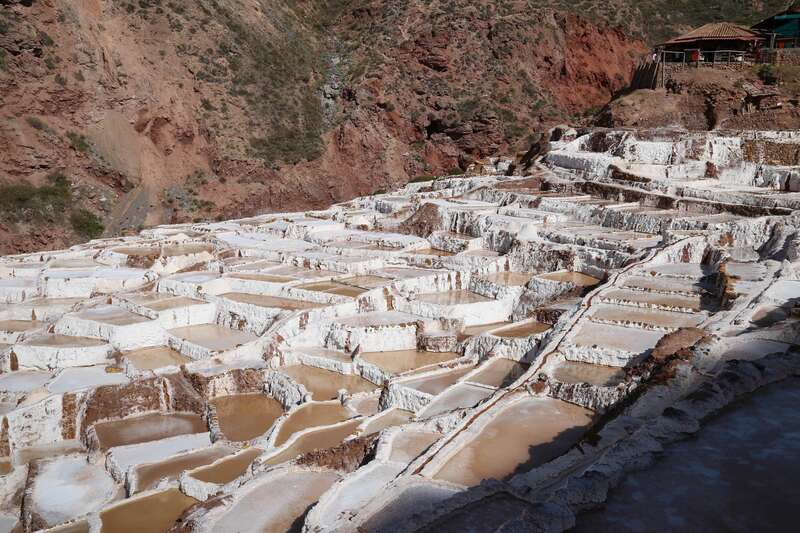 To ensure the best interests of the salt works the village of Maras operates as a cooperative, and by some estimates has been working that way since before the time of the Incas. This spring comes out of the mountainside at Maras, Peru as a brine slurry and will be apportioned into individual ponds for salt production. The brine spring, along the upper reaches of the Maras salt works looks clear and clean but it is quite salty to the taste. The work must be done by hand. Animals are not used because their wastes would foul the salt, and the walkways between the ponds are narrow footpaths sometimes just six or eight inches wide. Machinery would destroy the old and carefully constructed ponds, channels and weirs. 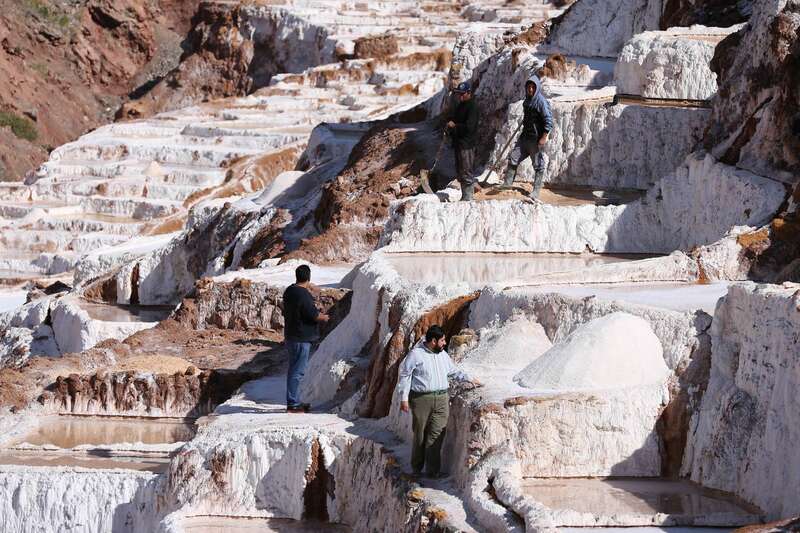 A group of salt producers looks over their ponds, gauging how much longer until harvest. Anyone who lives in the village can operate a salt plot, and currently about 300 families are involved in the trade. Also, if you marry someone who lives in the village you can obtain plots. As long as you work your plots, they are yours, but if you abandon them, someone else who meets the qualifications can acquire them. The most desired plots are those near the top, simply because getting to them and working those farther afield can be a tiresome trek. This is not a livelihood that will make you wealthy and many salt makers have other jobs to supplement their incomes. The light reflected off the salt ponds is intense, and cataracts are a problem salt workers must take into consideration. On a sunny day the light reflected off the salt ponds can be blinding and one serious hazard to working the salt ponds is cataracts, caused by years of working the salt pans. It is not always old age that causes workers to quit making salt, but the damage done to their vision. 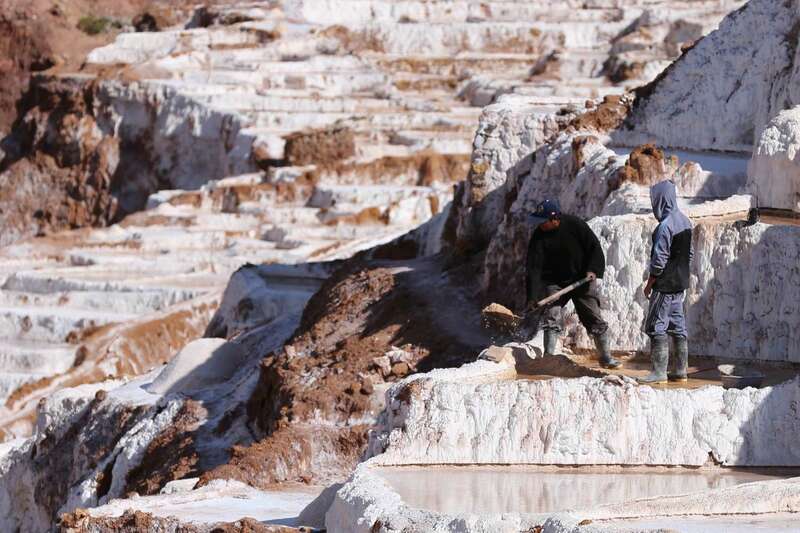 For visitors, it’s just a stroll along the salt ponds, but for the people of Maras, Peru, it’s a centuries-old livelihood. Salt, in the proper amount, is good for our bodies, and important in brain development. Too much salt can be dangerous to human and animal health. Excesses can lead to high blood pressure and raise the possibility of strokes and heart attacks. Saltwater from the ocean is about only 3.5 percent salt, but if consumed in any quantity it can be fatal. By the same token, too little salt in our diet can have serious health consequences, including cerebral and pulmonary edemas, problems with Type II diabetes, and an increased risk of bone fractures, particularly in the elderly. The recommended intake of salt for a healthy adult is between three-quarters and a single teaspoon per day. 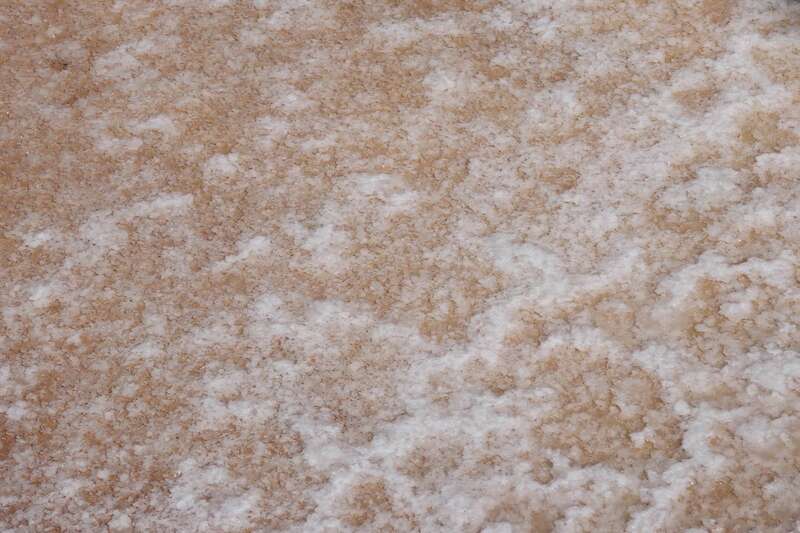 The evaporation technique like the one at Maras is one of three ways to produce salt. Along the seashore in temperate or warm climates, salt works use this method around the world. Deposited salt, found underground or in ancient sea beds can be mined. And vacuum evaporation uses steam to produce a highly consistent grade of salt. 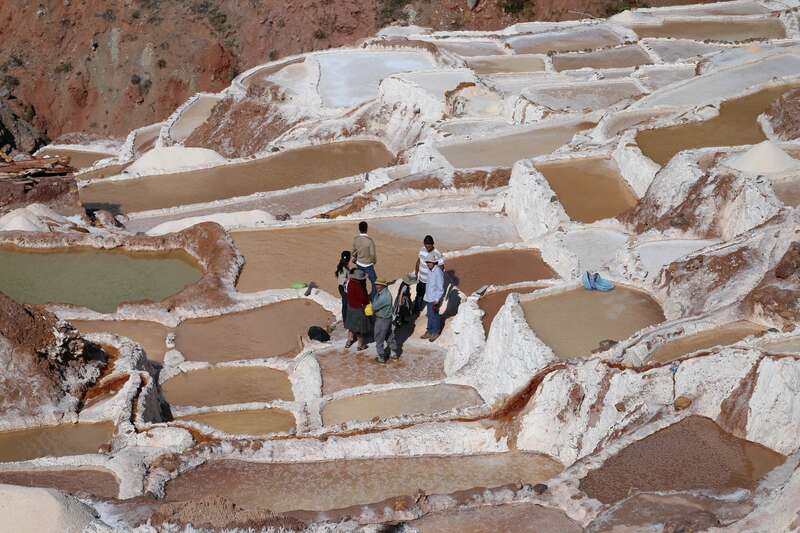 Before visitors get a chance to walk through the salt works, they pass by the vendors, top right, who sell small packet of salt from Maras, Peru. Regardless of how it is produced, just about everyone agrees that food with the right amount of salt tastes better. 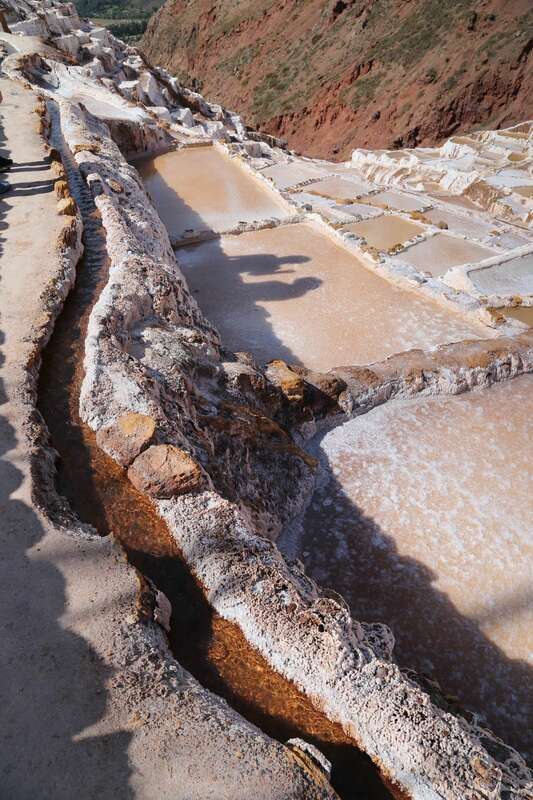 And one of the most interesting places in the world to see how salt is made is at the ancient Peruvian salt works of Maras. 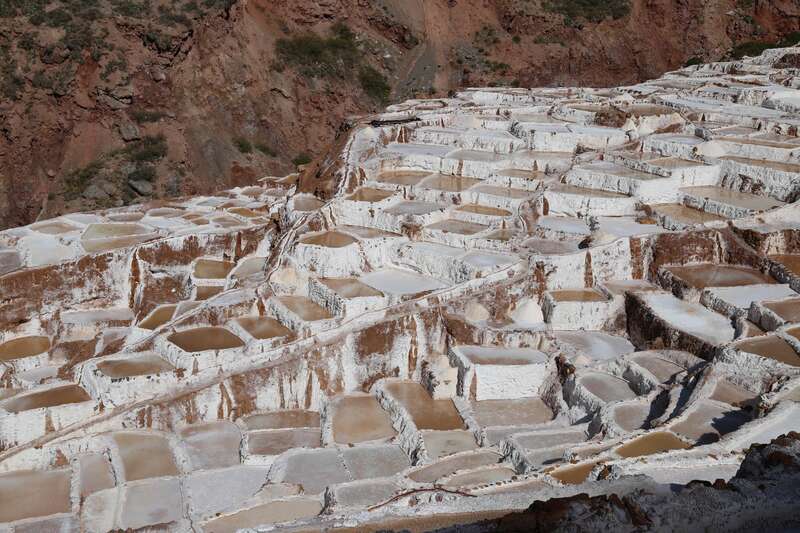 For well over a thousand years, these salt ponds at Maras, Peru have been producing high quality salt. 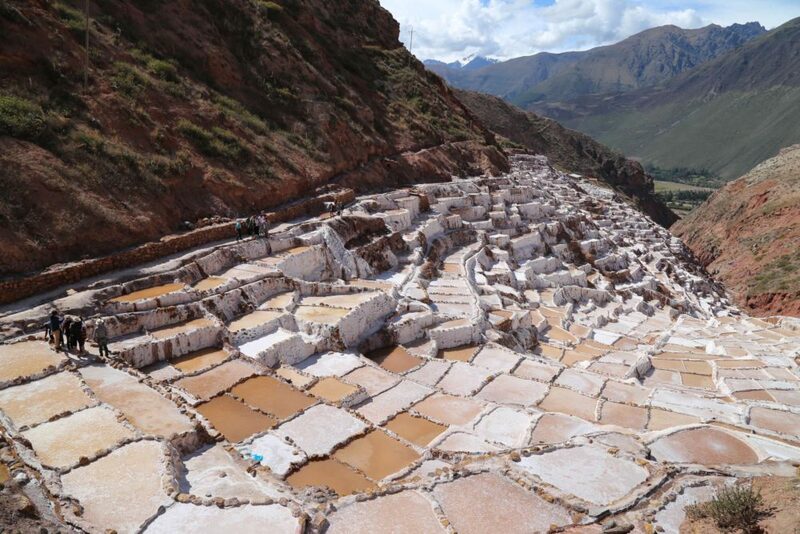 This entry was tagged A City A Month, Maras, Michael Kardos, Peru, Sacred Valley, salt flats, salt pans, travel. Bookmark the permalink.